The US National Transportation Safety Board (NTSB), concluded its limited investigation of the 16 November 2017 pipeline rupture near Amherst, South Dakota, with yesterday’s release of a pipeline accident brief and opening of the public docket. "NTSB says damage during installation led to Keystone crack"
The focus of the limited investigation was a metallurgical evaluation of the ruptured pipe. Materials engineers in the NTSB Materials Laboratory used optical and scanning electron microscopes and energy dispersive spectroscopy to examine the fracture surface and adjacent exterior pipe surfaces to determine the mode of fracture. The NTSB determined the probable cause of the failure of the Keystone Pipeline was a fatigue crack, likely originating from mechanical damage to the pipe exterior by a metal-tracked vehicle during pipeline installation. The fatigue crack grew and extended in-service to a critical size, resulting in the rupture of the pipeline. The TransCanada Corporation, Keystone Pipeline ruptured near Amherst, South Dakota, between the Ludden, North Dakota, and Ferney, South Dakota, pump stations. Keystone’s Supervisory Control and Data Acquisition system detected the leak and Keystone’s Operational Control Center in Calgary, Alberta, shut down the pipeline, but approximately 5000 bbls of crude oil were spilled. There were no injuries or fatalities associated with the incident. The docket contains the pipeline accident brief and investigative materials considered by the NTSB. The public docket is available here. The image is courtesy of the Pipeline and Hazardous Materials Safety Administration, showing the TransCanada Corporation Pipeline (Keystone Pipeline), which ruptured at Amherst, South Dakota, Nov. 16, 2017, at 4:34 a.m. Mountain time. 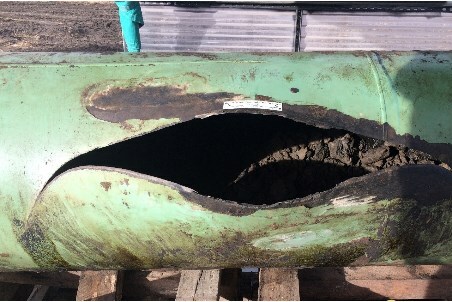 The picture identifies the ruptured pipe section, after it was cut at the point of rupture and extracted for transportation to the NTSB Materials Laboratory in Washington.